Today's #blogmas14 prompt was to take this Christmas cookie quiz and see what the results were! I'm a huge sucker for buzzfeed quizzes so I was totally on board for this one. The description said: "You are refined, smooth, and probably the most mature of your friends. We wouldn't want you any other way." 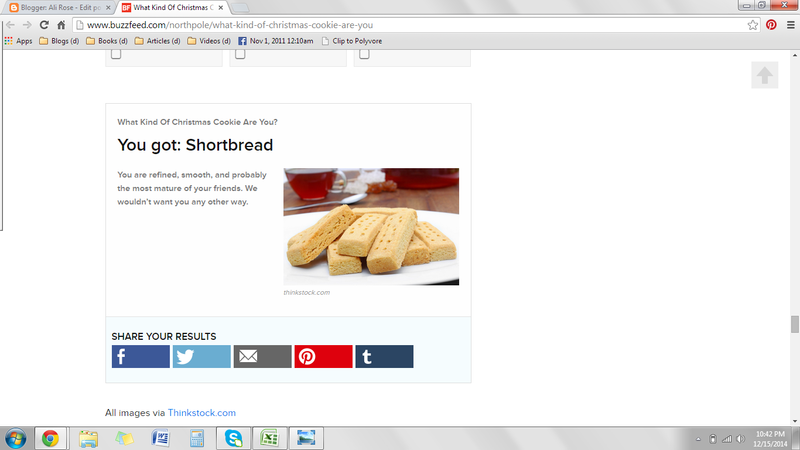 While I agree with the description (sorry friends if you're offended haha), shortbread has never been one of my favorite cookies. I guess I always felt like it was sort of boring...but I've been known to be boring from time to time so I suppose that choice is appropriate. What cookies did you all get? Have you taken any other fun holiday quizzes. I always stop what I'm doing to take them haha. See you all tomorrow! I am such a sucker for those damn buzz feed quizzes...they help nap time breeze by!